Making a tattoo is a big decision, as it is a mark that will accompany us for the rest of our lives. Many people go for it, and many more of us admire them and think about how we would like to have one, but we do not have the courage to do it. We’re overcome with the fear of thinking about what happens if we do not like it or if it looks bad when we get older. It can also be a sign of a bigger problem, maybe a fear of commitment and difficulty with decisions. We are not here to solve psychological problems but to talk about tattoos. Henna tattoos are an option for those who do not dare to get permanent tattoos. Henna tattoos are basically temporary tattoos. Henna is made from a plant. The powdered plant is mixed with warm water to make a paste that stains the skin. This dye uses a technique that goes back to the ancient Egyptians. Because of its ancient history, it is common that designs made with this reddish die tend to be traditional designs. Henna tattoos have many advantages. Besides the obvious advantage that they are temporary, they are also not painful since there is no penetration of the skin. In addition, the time it takes to apply them is usually much faster than a permanent tattoo and the cost is much lower, although this depends on the design. After applying the tattoo, it is left to dry for 5 or 10 minutes, after which a solution of lemon juice and sugar is applied. The paste is allowed to dry again, and this treatment helps the tattoo last longer. 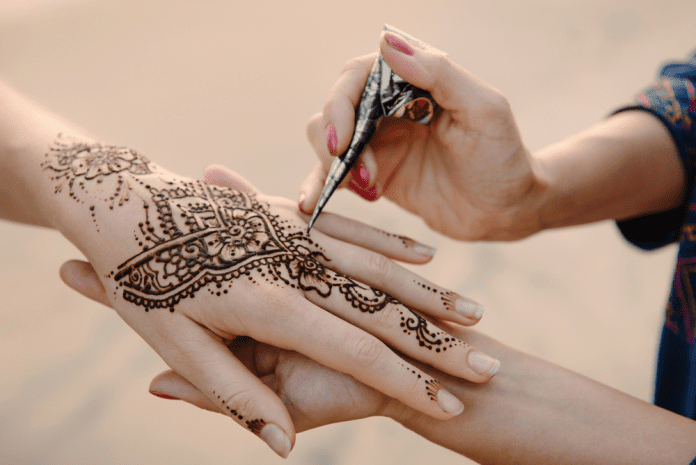 After the paste is removed, henna tattoos last approximately 10 to 15 days and will fade naturally. It is not possible to obtain a black color with henna alone. Black henna is created by mixing the henna powder with other ingredients. It is not advisable to use this type of dye, at it can cause health problems, especially when antibiotics are being taken. The side effects of the black henna do not necessarily appear immediately and may take up to 2 or 3 weeks. So if someone offers you a tattoo with black henna, run away, because that is undoubtedly a harmful product that can cause some serious problems. As for natural henna, there are no problems associated with its use unless you happen to be allergic to the plant, so we invite you to try this product and let your imagination fly with the most daring designs that come to your mind. Previous articleWhat Does a Triangle Tattoo Mean? Next articleHow Long Do Stick and Poke Tattoos Last?